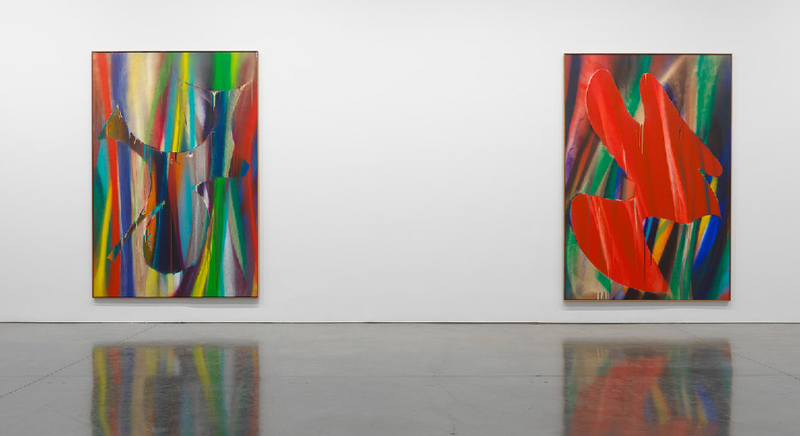 When I first saw Katharina Grosse’s paintings at Gagosian, my reaction was that they were too big, and that the surfaces were too flat–that they looked better on the computer screen than they did at the gallery. Berlin-based Grosse (b. 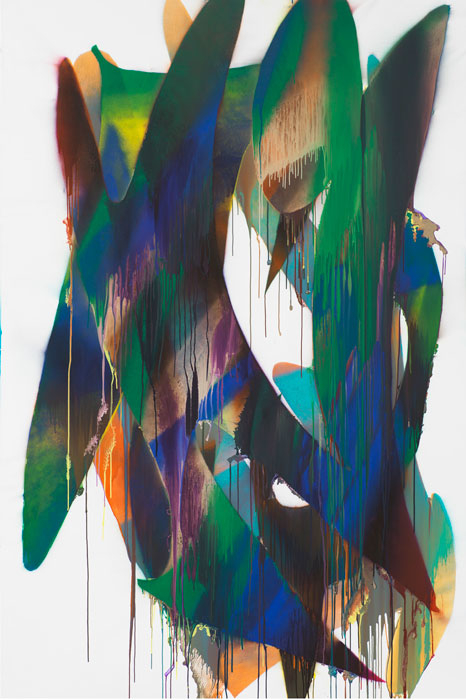 1961, Germany) is mainly known for large-scale three-dimensional work that features bright, unmixed, sprayed-on color that evokes abstract painters like Sam Francis and Helen Frankenthaler. 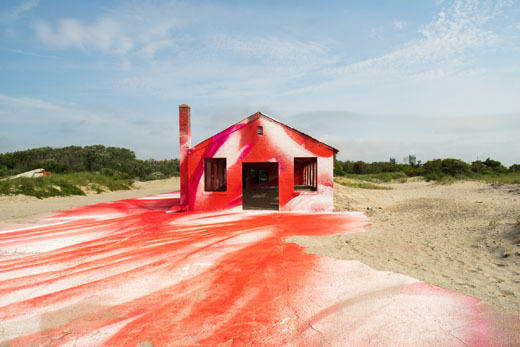 Readers may remember that this past summer Grosse completed “Rockaway!,” a controversial project commissioned by Klaus Biesenbach at MoMAPS1 in which she covered a Fort Tilden beach building (and some of the beach surrounding it) with bright red paint that looked as if it had been poured from the sky. “Rockaway! at Fort Tilden,” Katharina Grosse’s 2016 project at Gateway National Recreation Area at Fort Tilden, New York. 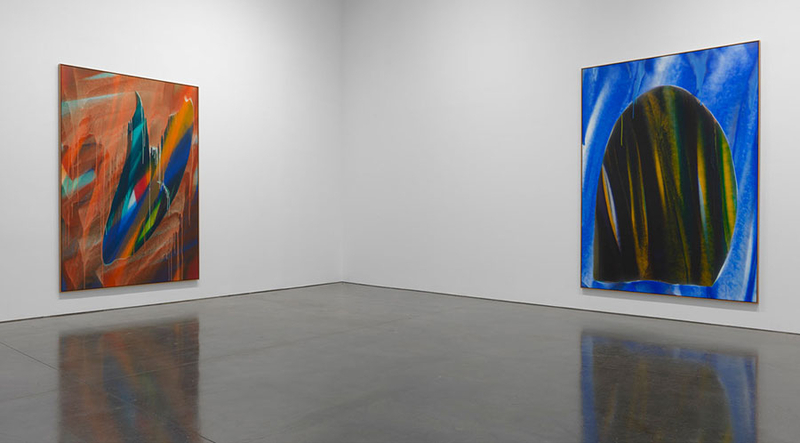 The strength of Grosse’s past work rested in the clever, audacious way she combined paint and physical structure. These new paintings on canvas, though ambitious and slick in terms of energy and scale, lack the improvisational element that working on an object or building provides. As a result, they seem essentially formulaic. Certainly they aren’t as compelling as the public art projects (or, for that matter, the three-dimensional sculptures that she paints). For color fanatics, I can see the attraction, but those less interested in color pyrotechnics than in structure, line, and surface may not be impressed. From an art market and museum placement standpoint, of course, these new paintings are obviously more practical than public projects. 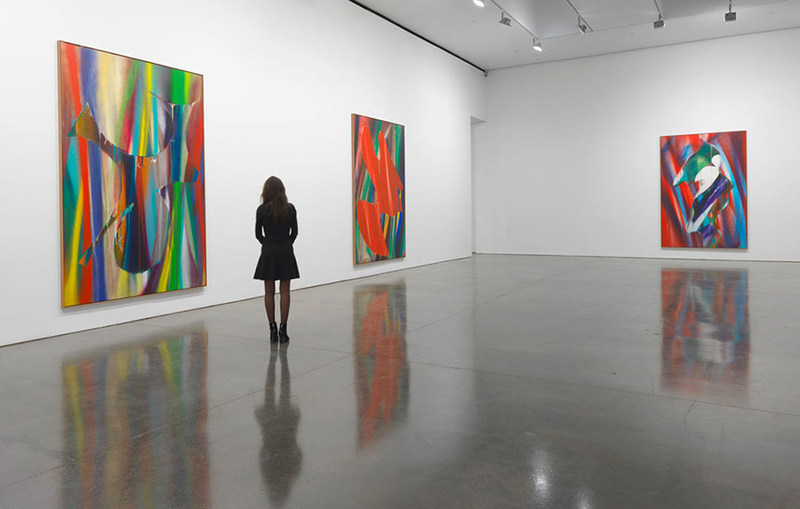 Furthermore, this is Grosses’s first show at Gagosian, and, let’s face it, almost everyone digs bright colors to some degree. 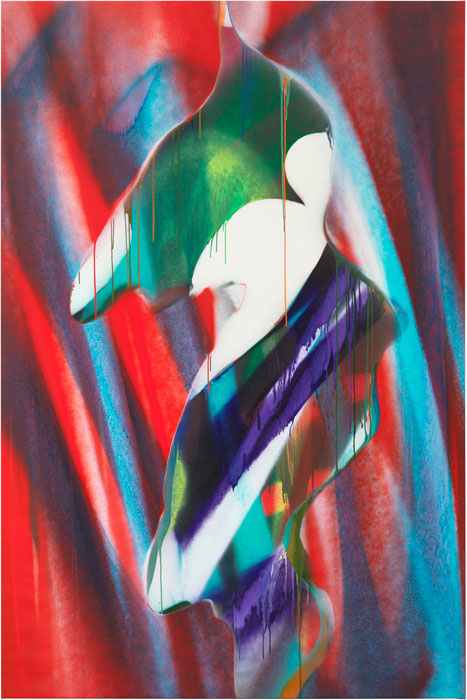 “Katarina Grosse,” Gagosian, Chelsea, New York, NY. Through March 11, 2017. Funny, in the 80’s this type of painting was casually dismissed as “still-born offspring of Abstract Expressionism”. I guess it took all these years for demand to finally catch up to supply. Maybe liquidity in the stock market has a correlation to liquidity on canvas. I think you’re really right about Katherine’s work on a certain level especially from the perspective of the exploration of mark making and layering of paint, which is I think so special in your work. For me I love how her boundaries start to dissolve with her installations which I find to be much more compelling. Her work becomes so static when it’s contained within boundaries of the structure of the square. 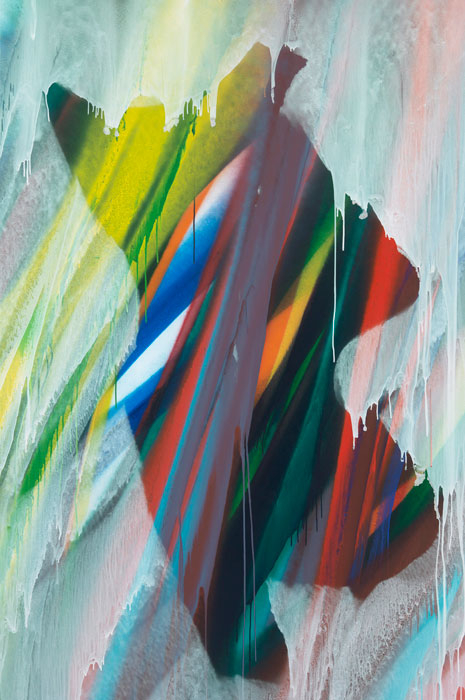 But I see what she’s doing with painting, she’s capturing areas that are perhaps puddling where a concrete shape is formed within the experimented mix and layering of color. I found her video to be very revealing. I liked how she discussed a male vs female interpretation of formalistic terms. I wonder if she is trying to use that male language to exceed its self from a female perspective. What do you think?